From the makers of the high-performance TFV8 Tank comes a brand new flavor-chasing option – the Smok Spirals Sub-Ohm Tank. 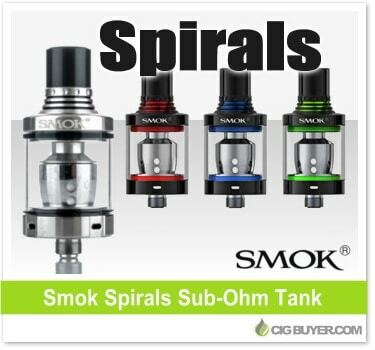 As the name implies, the Smok Spirals Tank incorporates a unique spiral coil structure designed to provide maximum flavor, with 8 large wicking ports to ensure consistent performance. It’s super compact, holds 2ml of e-juice with quad adjustable airflow and a threaded top-fill design. Choose from a 0.3 (20 to 45W) or 0.6 ohm (18 to 35W) dual spiral coil, or build your own with the 2-post RBA core.